Dog Ear Publishing releases “Tridoshik Recipes” by Shamila Patil Bhagirath. Author Sharmila Patil Bhagirath bestows the fruits of her many years of research in Ayurvedic cooking upon readers interested in using food as a route to wellness of body and mind in this new book released by Dog Ear Publishing. Ayurveda, the ancient Indian science of longevity, uses the natural aspects of food as a way to heal. Ayurveda is a venerable Indian tradition focusing on maintaining health and longevity using food as a medicine. Unlike many of today’s theories about health, this method of nutrition focuses not only on the nutrients contained within the food but the food’s digestibility and its post-digestion effect. In her new book, author Sharmila Patil Bhagirath explains the teachings of Ayurveda and the approach to food in addition to sharing many healthful, delicious recipes that will allow readers to maintain optimum health. According to Ayurveda, All matter is made up of five elements (space, air, fire, water and earth). These elements are represented in the body as Vata (air & space), Pitta (fire & water) and Kapha (earth & water) which are called Tridoshas. Food also contains these five elements. Building on this connection, Ayurveda utilizes energies of the food to heal and balance the body. So if you have more water element in the body creating imbalance and disease, Ayurveda recommends using food that contains more fire element to restore this imbalance. This is the basic principle behind Ayurvedic cooking. Tridoshik recipes are the ones which balance all three doshas. Ayurveda identifies certain food, spices and cooking methods that are tridosha balancing. The tridoshik recipes contained in this book help restore and maintain this balance in the body, irrespective of one’s doshas. Sharmila explains the different qualities of the doshas and shares the issues an imbalance can cause. After a thorough explanation of these different aspects, she dives into a huge variety of dishes that will tempt the palate of any reader. 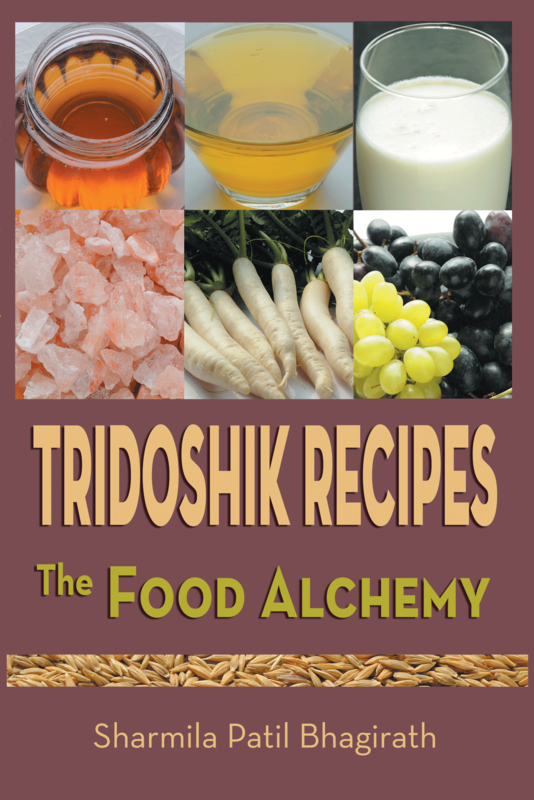 Tridosik Recipes: The Food Alchemy provides a thoughtful approach to food that will allow readers to maintain perennial good health as they eat delicious meals. Providing recipes that are easy to follow and practical, the author makes healthful cooking reachable to even novice cooks. Author Sharmila Patil Bhagirath, a freelance writer, hails from India, where she’s pursuing her second master’s degree from National Law School of India University in Bangalore, India. She has spent more than 15 years exploring the world of Ayurveda and shares the knowledge in this accessible collection of recipes. For additional information, please visit www.tridoshikrecipes.com.